THE appeal for funds to repair the tower of St Lawrence Church at Chobham will get around £2,000 from the village flower festival. 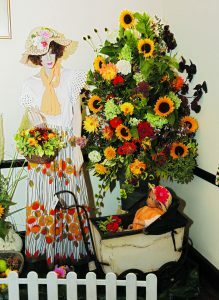 More than 500 people paid to view floral displays in the church and church hall on Friday last week and over the weekend. Money also came from donations and the sale of flowers from the arrangements. Along with those who attended concerts and services in the church, which included a christening and Songs of Praise-style event on Sunday, well over 1,000 were able to enjoy the arrays of flowers. The three-day festival café in the hall had its best ever takings, as diners were able to eat their meals surrounded by blooms and foliage compilations. Village groups and organisations from surrounding communities arranged the 50 exhibits, for an event which is staged every three years by the Chobham Festival. “We were delighted at the way this year’s festival went,” said festival committee chairman Paul Reed. “All the events were well attended and the standard of performances at the concerts was excellent. This year was the festival’s 23rd, and it again staged a series of contrasting events. The concerts included jazz, brass band, ukulele and classical performances and a literary lunch was again the opening feature. Saturday’s sell-out concert in the church, featuring the Red Priest quartet with a show called Handel in the Wind, was particularly well received. Musicians playing harpsichord, violin, cello and a range or recorders put their own exhilarating interpretation on famous pieces by the composer – with the audience demanding two encores.